Dr. Angie Miyashiro was honored as Kau High and Pahala Elementary's Teacher of the Year at the Hilo Chapter HSTA Teachers of Excellence Award Luncheon on April 22, at the Nani Mau Gardens in Kea'au. 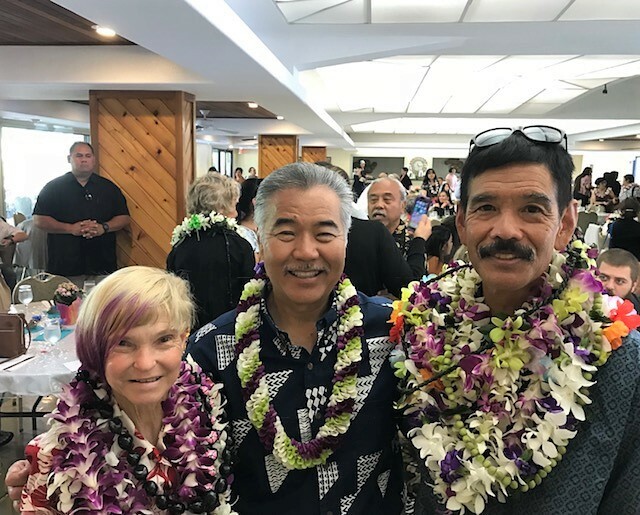 Along with her husband, Stewart Miyashiro, Teacher of the Year at Pahoa High, they were congratulated by Governor Ige during the procedures. Governor Ige addressed the attendees. Joining Dr. Miyashiro at the festivities were Mrs. Beck, Principal; David Berry, Special Education Teacher, and Siobhan Todd, Special Education Language Arts Teacher. Congratulations Dr. Miyashiro from your faculty, staff and students!